In this week’s guitar lesson, you’re going to learn how to play the classic Christmas melody to “O Holy Night” on electric guitar. As always, I’ll explain the “why” behind the notes so that you can create your own compositions like this. In this week’s guitar lesson, you’ll learn how to play a really fun Boogie Woogie style blues composition that doesn’t require any accompaniment. You can jam on this one all by yourself on acoustic or electric guitar. I’ll also walk through several useful takeaways that you can apply when playing rhythm or lead. In this week’s guitar lesson, you’ll learn how to play a minor key blues in B minor (although, I’ll show you how to easily transpose this and play it in any key). 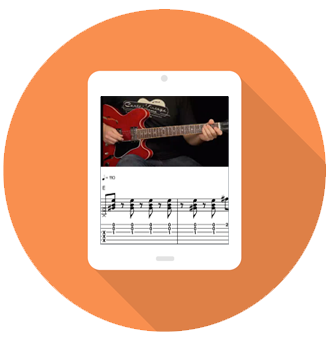 This is played with a percussive fingerstyle rhythm and requires no jam track – you can play this one all by yourself. In this week’s guitar lesson, you’ll learn how to play a rock, blues rhythm that sounds great on it’s own (no accompaniment needed). This lesson is designed to give you rhythm strumming and fill lick ideas to make you better at writing and improvising rhythm guitar. In this week’s guitar lesson, you’ll learn how to play a blues shuffle by yourself on guitar. I’ll start by showing you how to play a classic blues shuffle rhythm, and then layer in the lead licks in a “call & response” style. No accompaniment is needed when playing this composition. In this week’s guitar lesson, you’ll learn how to play a rock, blues lead in the key of C by mixing both major and minor pentatonic scales. I’ll explain the theory behind each of the licks so that you can use them going forward when you improvise (in any key). In this week’s guitar lesson, you’ll learn how to play 3 classic blues intros along with a unique lead and ending for each. Includes: an Elmore James style (triplet) intro, a classic blues walkdown intro, and one in which you start on the 5 chord. This is like 3 blues lead lessons rolled into one!